What is gun control and the controversy around it? The root of the gun control debate stems from a single sentence in the Second Amendment of the U.S. Constitution. 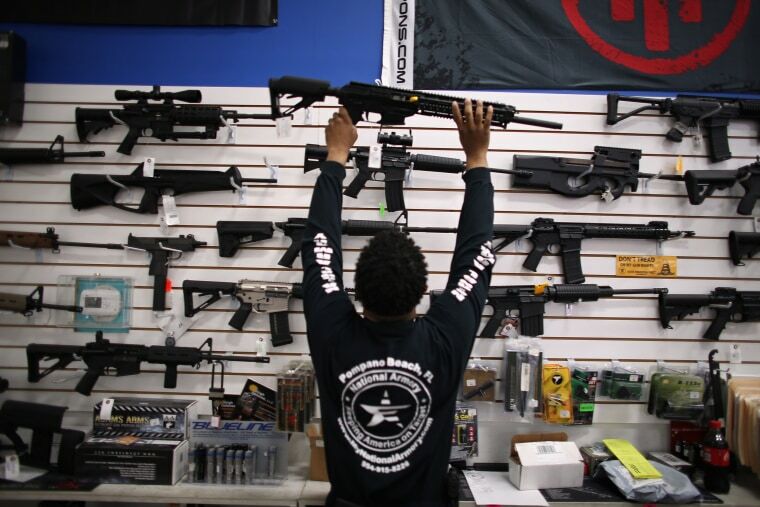 What kinds of guns should be available for sale to the public? Who should be allowed to buy them? Where can they be carried? When is it legal to shoot one? And does restricting guns make America safer? These questions form the core of the debate over gun control, one of the most divisive issues in American life. This debate has been raging since the 1960s, when gun rights blossomed as a national political issue. It has culminated in multi-million dollar lobbying campaigns, Congressional standoffs and large public demonstrations. The interpretation of that line separates those who believe in more regulation of firearms and those who see any such legislation as an infringement on their individual liberties. HOW OLD IS GUN CONTROL? As old as the United States. In the early days of the republic, black people ─ free and slaves ─ were barred from owning guns, as were Native Americans and people who did not pledge loyalty to the new country. A 1792 law required all eligible white men to buy a gun and enroll in a citizen militia, but those guns were also registered under state laws, according to UCLA Law professor Adam Winkler. Prohibitions against black people owning guns continued until the late 1800s, with the passage of new civil rights laws. The first modern gun-control laws, which targeted machine guns, sawed-off shotguns and required federal licensing of gun dealers, were passed in the 1930s with Prohibition-era gangsters in mind. The next wave came in the late 1960s, in response to the assassinations of President John F. Kennedy, Martin Luther King Jr. and U.S. Sen. Robert Kennedy, and calls by the Black Panthers and other black radicals for African-Americans to arm themselves. That led to the rise of the National Rifle Association as a political force, with the Second Amendment as its core principal. Major federal gun control legislation was passed in 1986, when the future sale of machine guns was prohibited, as was the creation of a national firearms database. A background check system was established in the 1990s, as was the so-called “assault weapons ban,” which covered certain semiautomatic rifles and expired in 2004. Gun-rights hardliners' dream victory came in a 2008 ruling by the U.S. Supreme Court, which decreed that the Second Amendment protected an individual’s right to possess a firearm for self-defense. State-level laws, meanwhile, remain patchwork, with many expanding gun rights and others restricting them. HOW MANY PEOPLE HAVE GUNS TODAY? It’s impossible to say for sure because there is no national registry of guns or gun owners. One estimate comes from the General Social Survey, which says about a third of American households ─ and 22 percent of individual adults ─ reported having a firearm in 2014. A more recent Pew Research Center survey estimated that in 2017, 42 percent of U.S. adults lived in a household with a gun and 30 percent owned a gun themselves. It’s equally difficult to determine how many guns are in the United States. A 2012 Congressional Research Service report put the number at nearly 300 million. But gun sales have also exploded since then, driven by “panic buying” over fears of more gun control. Gallup polling indicates a growing desire for more gun control; 60 percent say gun laws should be stricter, 5 percent say they should be less strict and 33 percent saying laws should remain as is. A February 2018 Quinnipiac University survey found 66 percent of respondents saying they supported stricter gun laws and 31 percent saying they didn’t.